The Ouachita Parish Police Jury (OPPJ) will meet Monday, June 1, 5:30 PM, Ouachita Parish Courthouse, second floor. Taxpayers of the City of Ruston will be on the hook for the rent “pursuant to certain terms and conditions,” for a new business that is locating at the old Ruston Airport on South Farmerville Street, according to a resolution that will be considered at Monday’s meeting of the Board of Aldermen. Additionally, the City will donate the land where a 100 thousand square foot factory will be built in which Monster Moto plans to manufacture mini bikes and go carts. Also, the land upon which the factory is to be built will be donated. 2. CITY OBLIGATIONS. City agrees to: 2.1 Convey to LEDC the property described on attached Exhibit “A” (the “Property”) and shown on the survey plat depicted on attached “Exhibit B”. The meeting will begin at 5:30 PM Monday, Ruston City Hall, 401 North Trenton, first floor. 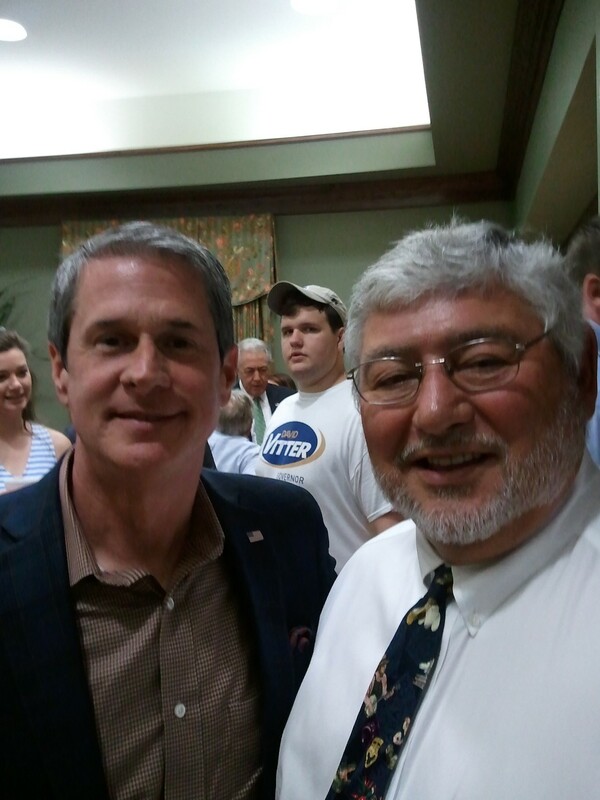 U. S. Senator David Vitter (R, LA) made a brief stop in Ruston this morning while campaigning for Governor. Speaking to supporters at the Ruston/Lincoln Chamber of Commerce on North Vienna, Vitter said he was accelerating his campaign, and touted his polling and fundraising. He added, “We have a great lead (in polling), somewhere around 35%. Then the Democrat in the race, John Bel Edwards is around 28%, maybe 30%. Downsville Mayor Reggie Skains noted that even though Vitter was a South Louisiana Congressman, he always would see him whenever he visited Washington. At least three North Louisiana legislators voted this morning for a statewide one-cent sales tax hike that would have funded highway construction and maintenance. HB 778: Levies a 1% state sales and use tax for 10 years to be used for construction of specific highway and bridge projects that are part of the major economic development corridors of the state, and investment in the La. State Transportation Infrastructure Bank. The bill failed on a 52-42 vote. It needed a 2/3 vote to pass. You will never, ever, read about these votes, or any other votes by legislators, in The Ruston Daily Leader, The (Shreveport, LA) Times, or The (Monroe, LA) News Star. One of the recurring agenda items at municipal meetings that we’ve reported upon is condemnation of substandard property, and last night’s meeting of the Monroe City Council was no exception. Chapter 24.5 of Monroe’s Code of Ordianances deals with the issue of nuisances and abatement, and is the legal authority for government to condemn or otherwise force upgrade of substandard property. Last night, three such properties were on the agenda, and they were discussed with little controversy. In one of the instances, an extension to the normal thirty day deadline was granted to allow the property owner to bring the structure up to code. However, at the end of the meeting, during public comments, property owner Michael Wade made his case of why he thought he was unfairly treated at the May 12 council meeting when his property was condemned. Wade said that a letter from the city confirming the council’s decision did not list any code violations, and should be invalidated. Mayo told Wade to meet with him after the meeting. In other business, the council heard from Daniel Howard, Chancellor of Louisiana State University of Alexandria (LSUA). He made the trip to thank the city for donation of several horse stalls from the city’s Equestrian Pavilion. Howard said the the stalls would be utilized for the new Rodeo Team now being organized at LSUA. Community Affairs Director John Ross said that the pavilion had not been used for some time, in response to a question by District Three’s Betty Blakes. Several North Louisiana Legislators voted to kill a sales tax holiday for guns and other hunting related items. 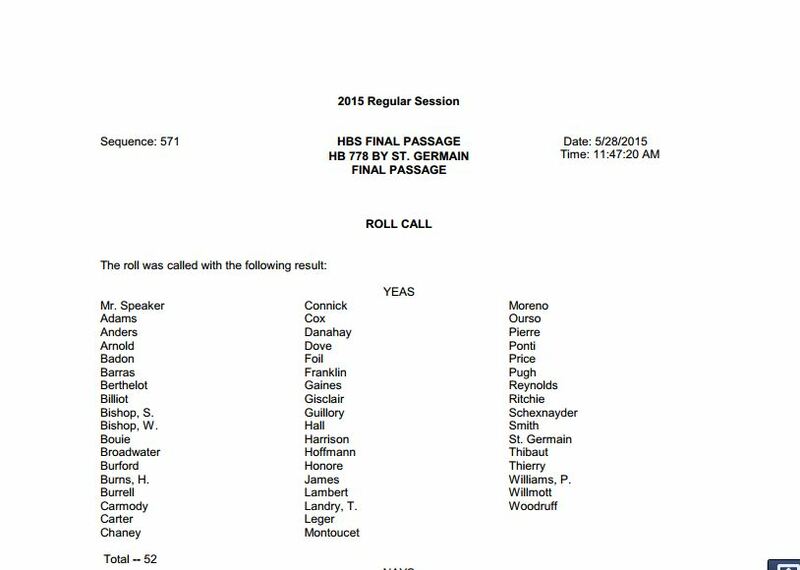 Among those voting for HCR 15 were Ruston’s Rob Shadoin and Jonesboro’s Jim Fannin. See here the complete list of who voted how. The law, known as the Annual Louisiana Second Amendment Weekend Holiday Act, exempted firearms, archery equipment, ATVs, apparel, and other hunting related gear from Louisiana Sales Tax. The holiday had been in effect the first weekend in September each year since 2009. See here the repealed law. The Monroe City Council will meet tonight (Tuesday, May 26), 6:00 PM, Monroe City Hall, 400 Lea Joyner Expressway. Here is the information packet. Monroe Chamber of Commerce President Sue Nicholson is one of the top 10 lobbyists in the state, ranked by expenditures, according to an analysis published in the 5/18/15 edition of The (New Orleans) Times Picayune. The expenditures are for the years 2010-2014. Much of the organization’s revenues are paid by the City of Monroe and the University of Louisiana at Monroe. During 2014 and 2013, the Chamber received $92,500 and $97,500, respectively (11% and 12%, respectively, of total support in each of these years) from the City of Monroe, and the University of Louisiana at Monroe. All of the funds received from these local entities was used to support the costs of the Chamber’s consulting lobbying firm. See also the Chamber’s 2013 tax return. A secretary at the Florida Parishes Juvenile Detention Center who thought her bosses had pegged her as a whistleblower and planned to fire her now faces prosecution for recording her supervisor’s conversations without his consent. Meanwhile, the actual whistleblower has sued the Florida Parishes Juvenile Justice Commission, which oversees the detention center, claiming management forced her to quit her job as a payroll clerk after she notified the state Office of Inspector General of possible payroll fraud. The commission’s lawyer, John Feduccia, could not be reached for comment Friday. Attorney Tom Hogan, who represents both the secretary and the former payroll clerk, declined on Friday to comment on the cases. An IG investigator met with Joy Chauvin, the secretary, after receiving a complaint in February 2014 about mismanagement at the detention center, which serves Livingston, St. Tammany, St. Helena, Tangipahoa and Washington parishes. The IG’s office would not disclose what prompted the meeting with Chauvin or when it took place. Chauvin told Michael Moore, the investigator, she believed the detention center’s management thought she was the source of the IG complaint, and she was being targeted for retaliatory dismissal, according to an affidavit of probable cause for her arrest. You are currently browsing the Lincoln Parish News Online blog archives for May, 2015.